Rendering of a potential interactive art exhibit in Main + Marketplace. Via CTA Architects. The former Capitol Terrace building at Main St. and 8th St. got an exterior revamp over the past year. Now changes are coming to the inside. Hawkins Companies bought the building, now known as Main + Marketplace, in 2017. Late last year, two long-time local restaurants closed: Shige and Piper Pub. Now Hawkins has a big new tenant signed, but they are being tight-lipped on what is coming. Company representatives appeared in front of the Capital City Development Corporation earlier this month to outline possible changes to the building. CCDC and Hawkins are 50/50 partners in many of the common areas of the building, and Hawkins is looking to take on more financial and design responsibility, which will need CCDC’s approval. During a presentation to the Capital City Development Company early this month, Hawkins Co.’s Brian Vaughn said they’ve signed a new restaurant tenant for the building. Public records and leasing documents indicate the new restaurant will take up all of the former Piper Pub space, as well as a portion of the former Shige. Vaughn said he was under a non-disclosure agreement on the name of the tennant, but said they would take up about 5,000 square feet on the south end of the building. Vaughn said the restaurant would operate all day from morning until night. A Hawkins Company representative would not elaborate further on the name of the restaurant. Rendering of revamped patio space of the former Shige at Main + Marketplace. Via CTA Architects. Hawkins is also working to secure another restaurant for the remainder of the vacant second floor space. Vaughn said they are working to secure a lease. They may revamp the current patio area to be larger and more self-contained. A new stairwell is proposed to connect the first and second floors along 8th St. It would sit behind the current escalators near Donut Daze. 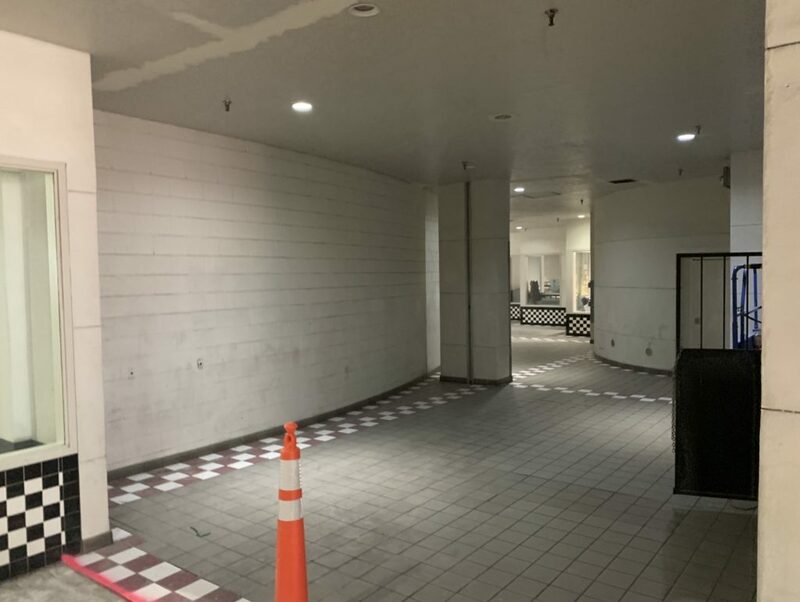 They are also looking at an interactive art exhibit for a dark hallway that wraps around behind the retail tenants on 8th Street, connecting with Main St.
“We are working on an expriment with the back hallway,” he said. “These lights would hang on a string and people could draw murals. It would have an ability for people to be interactive with it. Our goal is to make this a 365-day art exhibit. The LED lights would be changable, giving passersby the ability to draw or create images. “We are trying to find reasons for it to be exciting and draw people in,” Vaughn said. He said they might also secure the hallway after business hours. CCDC commissioners asked Vaughn about the changing tenant mix – since the signed restaurant lease is for an out-of-state concept. He said the Balcony Club is “the anchor” for the property, and said they are why it’s been successful. If you've walked around Downtown Boise this summer, you may have noticed many buildings sporting brand new awnings over the sidewalk.